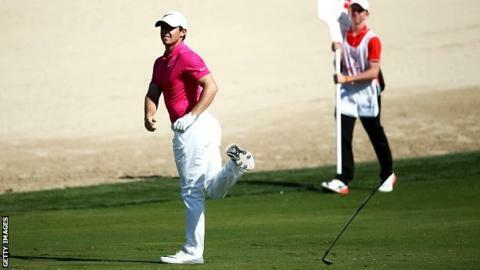 Defending champion Rory McIlroy threw his ball into a lake in disgust before recovering with four late birdies in round two of the Dubai Desert Classic. McIlroy, 26, ended the day on four under par after an even-par round of 72, which left him six shots behind leader Rafa Cabrera-Bello of Spain. The Northern Irishman made four bogeys on the outward nine and slipped back to level par with a fifth at the 11th. He salvaged the situation with birdies on the 13th, 16th, 17th and 18th holes. Cabrera-Bello, the 2012 champion, carded a second consecutive 67, while England's Danny Willett (65) and Ernie Els (67) were tied for second on nine under. "I struggled in the wind a little bit," McIlroy told the European Tour website. "I didn't get off to the best of starts again. The middle of the round was tough but I bounced back well and persevered and got something out of the round." McIlroy bogeyed his opening hole for the second day running and then tossed away his ball after three-putting the fourth on his way to reaching the turn at three over for the day. A three-putt bogey on the 11th then saw McIlroy slip back to level par and outside the projected cut, and it required a testing putt to avoid the same fate on the next before a run of birdies rescued his round. "I was definitely thinking about (missing the cut), especially over the putt on 12," added McIlroy. "If I missed that and went one over for the tournament it would have been a long way back. "I've come back from bigger deficits than this and if I can get off to a faster start tomorrow, you never know."